Designed specifically for new parents, this kit was created for families who want to cloth diaper on a budget from the first days of life. It's perfect as a shower gift for someone who wants to experiment with cloth diapering. 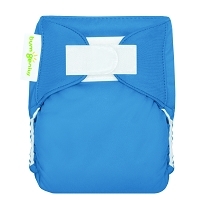 Conveniently packaged inside an Econobum Wet Bag, each Newborn Cloth Diaper Starter Kit includes 2 Econobum Newborn diaper covers with hook & loop closures, 6 soft organic cotton prefolds, 6 stay-dry liners, bumGenius Detergent sample and instructions. Econobum is the cloth diapering solution for every budget! 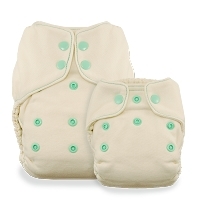 Save money while making the environmentally friendly choice to cloth diaper little one's bum. Ultra-gentle leg elastic will keep the messes in! Hook & loop, just like disposable diapers. Wash hot, line dry cover, tumble dry prefold. No laundry additives or softeners. Prior to first use, prefolds must be washed 3-5 times in hot water with a small amount of detergent to ensure maximum absorbency.